Cindel Towani was the main chracter of two (now considered Legends) TV movies that took place on Endor. 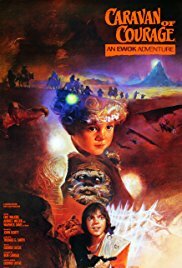 Caravan of Courage: An Ewok Adventure debuted in 1984 (a year after the release of Return of the Jedi). A year later in 1985 Ewoks: The Battle for Endor premiered. In Caravan of Courage Cindel (played by Aubree Miller) and her brother Mace spent most of the movie trying to reunite with their parents after a starcruiser crash on Endor. Not surprisingly the Ewoks help the kids find their parents. Cindel ends up leaving Endor and the Ewoks (why?!?!?!) and grows up to be a journalist on Coruscant. Read more about Cindel on her Wookieepedia page. Here’s a trailer and clip from Caravan of Courage. 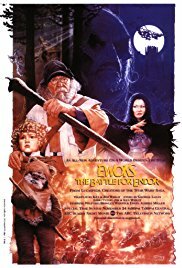 You can see the full movie Ewoks: The Battle for Endor here (with a starry background) or if you just have a few minutes here’s the trailer. Cindel was also the focus of a fun fan theory that she could be part of the origin story for Phasma.